Ted Colbert has one of the largest roles in IT, that of CIO of $96 billion aerospace and defense giant Boeing. Still in his early 40s, Colbert’s rise has been like a 787 Dreamliner taking flight. He has balanced an innovation and digital transformation agenda while pushing the diverse businesses to do more commonly. In so doing, he has been a driver of both top and bottom line value for the enterprise. At the same time that he has helped the company become more innovative, he has also stewarded in a sophisticated security program. As a reward for his team’s great work, last week, Colbert added the title of SVP of Information and Analytics to his responsibilities as CIO. Peter High: Ted, I thought we would begin with the transformation that you have been leading as chief information officer. Could you give us a brief overview of some of the activities that you’ve been leading? Ted Colbert: The business we are in is growing, challenging, super diverse, very complex, and change happens at a pace that sometimes is fast and sometimes slow. Last year, we launched a program around geographic diversification. We have a significant presence down in South Carolina. Two years ago, there might have been 10 IT employees there. Now, we have almost 700 IT employees in South Carolina. We have several hundred additional employees in St. Louis. We balance our workforce around the country to get access to different types of talent, to have diversity, to be connected with our business, and to fit the business around the US. We are spread across the country and that has offered us some other opportunities from the people perspective. High: IT has created the laudable goal of becoming more aligned with the strategic plans of the different parts of the organization. How do you do that organizationally? Colbert: We are an engineering company, so innovation is everywhere. 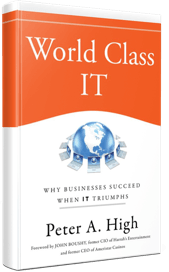 You do not have to go the IT team to find innovation. We have engineers and software designers and developers in all the parts of organization. 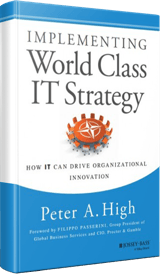 I also lead the CIO strategy council which is a group of senior executives. It is probably two or three degrees from the CEO. We meet every other month or so, and go through what we are doing to drive operational excellence in the organization. Then we pick some specific topics from a strategic perspective to ensure we are aligned on them.